With a two song set running at 18 minutes sandwiched between arena rock giants U2 and Queen, Brit rockers Dire Straits had their work cut out for them when they took the stage at 1985’s global jukebox Live Aid. Never ones to play by the rules, the band kicked things off with an explosive rendition of the newly released “Money For Nothing” – a highly controversial look at the life of rockstars, told through the eyes of a blue collar worker content to bash the stars he sees on MTV while secretly being fiercely envious. Adding to the crowd’s anticipation of Dire Straits appearance at Wembley that day was a very special appearance from The Police’s Sting, who provided the melodic little “I want my MTV…” you hear on “Money For Nothing”- but judging by the frenzied screams of the audience, it was singer and guitarist Mark Knopfler who really got the party started that day! Fun Fact: The original cut of “Money For Nothing” includes a derogatory slur that can only be heard on the Brothers In Arms vinyl. Knopfler defended the song’s original line, saying it didn’t reflect his personal feelings, but that of the song’s main character. What an incredible day, backed by incredible performances like this one. 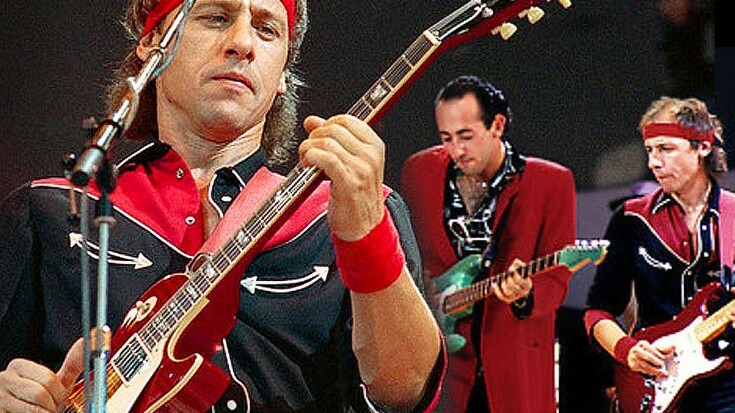 If you missed Dire Straits at Live Aid the first time around, never fear: check out this amazing footage from rock’s big day out in the video below!